Summer completely took over my life! I have been enjoying every minute I possibly can with my children outside in the sun and, yes, enjoying the heat! I figure summer up here in NY is too short, so I must not miss a minute of it! I have been neglecting things…such as my blog posts. Maybe I should start re posting my older posts, like my husband is doing on his blog, Sails and Stars. But I think he is doing it because he has writer’s block! Haha! We have done a lot of FUN things this summer. Most of what we have done has been with the Toga Tots. They are a mom’s group I found up here. I was nervous at first about attending functions with complete strangers, but now we are a big happy family! We get together for playdates at parks, museums, crafts and such. And we also get together for Mom’s Night Out! A much needed break. I also found a Stroller Strides franchise up here! I LIVED for Stroller Strides in Mount Pleasant, and the hardest transition was not having a franchise up here. Then I found Julie, and her Stroller Strides franchise. For a while it was just her and me….but we have grown! There are now four moms “striding” full time! It’s so much fun, and the children love it! Alexei and I have been out on a few dates as well. The last one was probably the best! We went to SPAC to see CREED. They had two opening acts, Theft and Skillet. Skillet was rocking. The lead singer was very animated, dancing and jumping all over the place WHILE playing base guitar! Very impressive! Also the drummer was a woman and the lead guitar was a woman! Lots of points in my book! haha Creed came on last…they were as always great! I love their music! They played new and old! SPAC was great as well. The parking was free and efficient. The bathrooms were clean and barely had lines. We had elbow room and were able to see the stage perfectly from our lawn seats! And when it came time to leave it only took us about 15 minutes to get out of what looked like a parking disaster! Last night was ladies night out with some other Navy wives to celebrate a birthday! 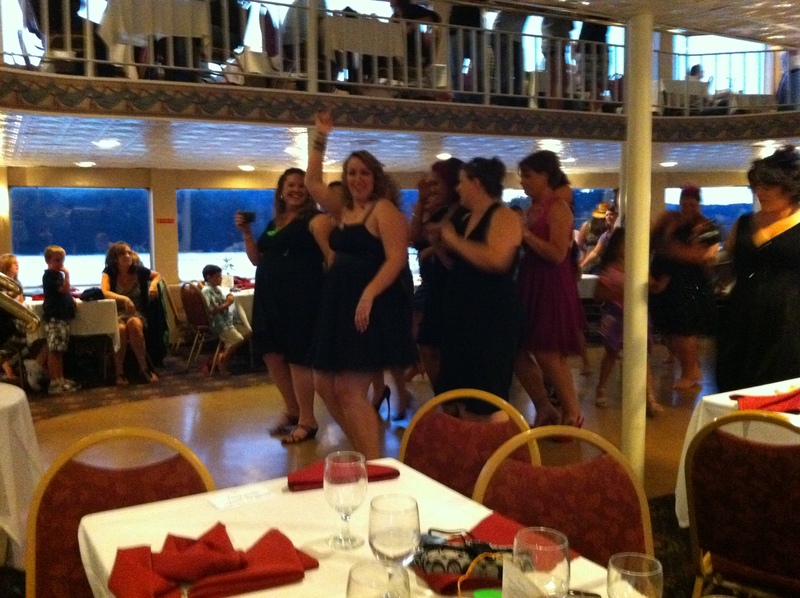 We went up to Lake George and took a dinner cruise! The ladies I met up there arrived in a stretch limo looking fabulous in cocktail dresses, which was the dress code for the evening. We ate, sang and danced our way around Lake George before heading downtown to a club to dance the rest of the night away! I stayed with them until midnight, and then headed out. I’m 27 weeks pregnant, and was getting tired. It’s wonderful that you had such a busy summer you didn’t post! It means you’re settling into your new life nicely with your gorgeous family. I’m really beginning to wonder if they have something like Stroller Strides in London, hrm… Time to investigate. I, too, am looking forward to autumn. Apples, pumpkins, sun shining through multicoloured leaves… my favourite time of the year!